SCOTTISH butcher, Simon Howie, is launching a £10 ‘goodie bag’ available exclusively from his award-winning shops in Auchterarder and Perth on Friday 22 July. 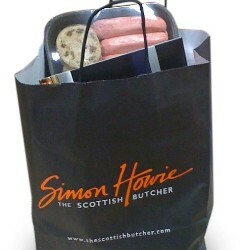 Comprising eight different products – offering a total saving of 25 per cent – the contents of the first ever Simon Howie goodie bag are: steak sausages; pork sausages; lorne sausage; black pudding; boneless pork chops; beef olives; chicken kebabs and two mini steak and gravy pies. Simon Howie Foods started out with a small village butcher’s in 1986. In addition to its own butcher shops in Auchterarder and Perth, the business services some of the most prestigious hotels and restaurants in Scotland, as well as supplying all of the UK’s leading supermarkets, including Sainsbury’s, Morrisons, Tesco and ASDA. In addition to winning the title of UK Butcher’s Shop of the Year in 2006, and the Scottish title in 2009, Simon Howie was named Entrepreneur of the Year in 2008 by the Entrepreneurial Exchange.